Toddler Sleep Problem: My Toddler Takes Cat Naps All Day Long! -Make sure she is put in to her crib at 7ish AWAKE. This is the easiest time to learn how to put yourself to sleep. If she does not have it mastered here she will have a harder time at 6am and at nap times. If she has a milk cup right before you put her in her crib, I would change this and instead switch to water and give the cup with the light on while you are reading books. -I would recommend you stop giving her a milk cup at 6am so that she will go back to sleep. You don’t want her to further associate going back to sleep with having a milk cup. Better for those pearly whites and for giving a clear message about how we go to sleep. -Sounds like you will have to nap coach your daughter to help her learn how to take longer and more restorative naps. 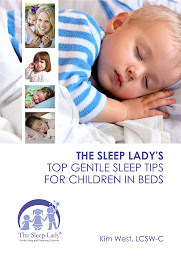 I discuss gentle nap coaching in my book, The Sleep Lady’s Good Night Sleep Tight on page 194-197 and Chapter 4 in my WORKBOOK. If you aren’t already doing so you will need to put your daughter in her crib AWAKE for the onset of each nap. This is the bare minimum for a nap. If she wakes up happy and seemingly refreshed, that’s okay, but be aware that she might be ready for her afternoon siesta sooner rather than later so you don’t miss her sleep window. In addition, do all you can to make sure that the afternoon nap doesn’t get cut short. I find that when babies wake up happy after a 45-minute morning nap, they often don’t wake up happy and refreshed after a 45-minute afternoon nap. If your child wakes up after 45 minutes from his later nap, use the Shuffle techniques to get him back to sleep (try for at least 30 minutes if you can). This is a “disaster nap.” When a child sleeps for fewer than 45 minutes, she doesn’t go through a complete sleep cycle; technically, her wide-eyed state is really a partial arousal, not true wakefulness. So here’s the tough message: I want you to go to her and do the Shuffle for an hour—what I call “the longest hour.” Here’s an example: You put your child in her crib at 12:30 p.m., she conks out at 1:00, but only sleeps until 1:30. You go in and work on getting her back to sleep—which she does, thankfully, by 2:00, after just half an hour. But she only sleeps for 20 minutes. Chances are the negative voice in you is going to say, “I can’t believe the Sleep Lady® told me to do that! She cried more than she slept. What’s the point of that?” But think about it: Your baby did it! She put herself back to sleep after a partial arousal from a nap—one of the hardest things to do. Going forward, she’ll begin to get back to sleep more quickly and will snooze for longer, if you stick with it. You go to a backup plan if you check your sleep log around 2:00 or 3:00 p.m. and realize that your child hasn’t had enough day sleep. You want to make sure that he sleeps one way or another for a decent interval before the afternoon is over, so that you’re not set up for a bad night. A backup nap can take place in the car, stroller, swing (for younger children), or carrier, but try to make it different from a habit you’ve been trying to break. For instance, if you’ve been working on ending co-sleeping at night, don’t put him in your bed for his backup nap. Try a car ride or walk in the stroller instead. Ideally, the backup nap will last at least 45 minutes, and your child will be awake by 4:30 p.m. so that he’s ready to sleep at his regular bedtime. Try not to make the window of wakefulness between afternoon nap and bedtime greater than 4 hours or you risk her being overtired. You will be tied to the house during the nap coaching process. If you feel like all you’re doing all day is trying to get your child to go to sleep, then you’re doing everything right! Hang in there. You can do this!